Relish the memory. : Passionate about Pomegranates. Ever spotted one of these reddish-gold circular balls and wondered what on earth is going on under there? Well upon venturing past it’s leathery exterior I discovered a world of beauty and delight…amongst a maize of white; sits rows of small glossy pinky-red balls also known as seeds or arils. Such precious pieces deserve a more elegant name, and pomegranate pearls are the perfect description. This summer fruit has grown hugely in popularity in the culinary world over the last few years – in its many different forms: seeds, juice and that thickened gold – molasses. There is no debate that its one downfall is the de-seeding process. Following a quick you-tube search I discovered various tips about how to pop out these pearls at record pace. Some suggest de-seeding underwater, others mentioned cut in half then again down the white ridges and peeling accordingly. I used a combination of the two – but mostly just dove in and made a red, juicy splattering mess -placing one in my mouth for every five that went into the bowl. Pomegranates have been popping up everywhere in our household menu lately. 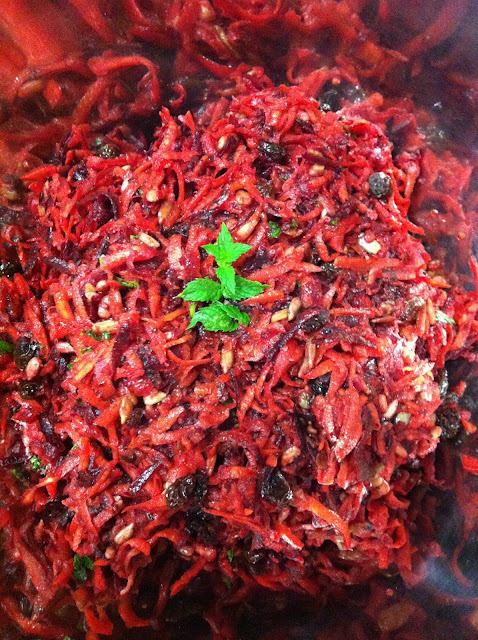 A favourite Christmas present housed the recipe for a Pearl barley, eggplant, carrot and pomegranate salad. The Ripe Deli on Richmond Rd – our go-to weekly lunch destination has put together a book of their best recipes, and boy am I glad they did! If you do not own this publication, go to the book store and buy it NOW. You will never look back. Packed with bold flavours such as sumac, dried mint, honey and fused together with tones of pomegranate. This salad is not for the faint hearted. Utilising the seeds, juice and molasses it was punchy, sweet, texturally surprisingly and in my house a huge hit! Pearl Barley, eggplant, carrot and POMEGRANATE salad. 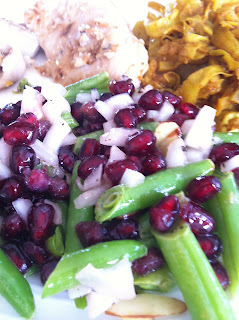 A second more simplified salad consisted of fresh green beans, diced red onion, sliced toasted almonds and a handful of those pomegranate pearls. Dressed in a combination of freshly squeezed orange, olive oil, apple cider vinegar, salt and pepper. It was heaven and summer all on one plate. There is a reason Pomegranate Molasses has found a home in the pantry of many culinary kings. The intriguing depth of sweetness and viscosity gives a unique dimension to any dish and makes it the perfect addition to any dressing. Another winning dish from the Ripe cookbook contains this liquid gold. Being their most popular dish this ‘Raw Energy Salad’ sells out most days. A similar version can be spotted in my Beetroot = Bestroot post – but as with most things the experts know best. This salad screams health, freshness and flavour. It’s not just good, its bloody great. Providing yet another reason why making the ‘Ripe’ cookbook purchase is a must. PS. The lovely people at Ripe are so great they have shared the recipe here. Raw Energy Salad made beautiful by pomegranate molasses. Fabricating fare for the Georgia Alice Launch.